I’m fortunate to live in Paris, a city where there’s an unusually large amount of very good chocolate shops. With so many to choose from, it’s hard to whittle it down to just the few, most perfect ones. But I must. And one of them is John-Charles Rochoux. His jewel box of a shop is located just off the bustling rue de Rennes. 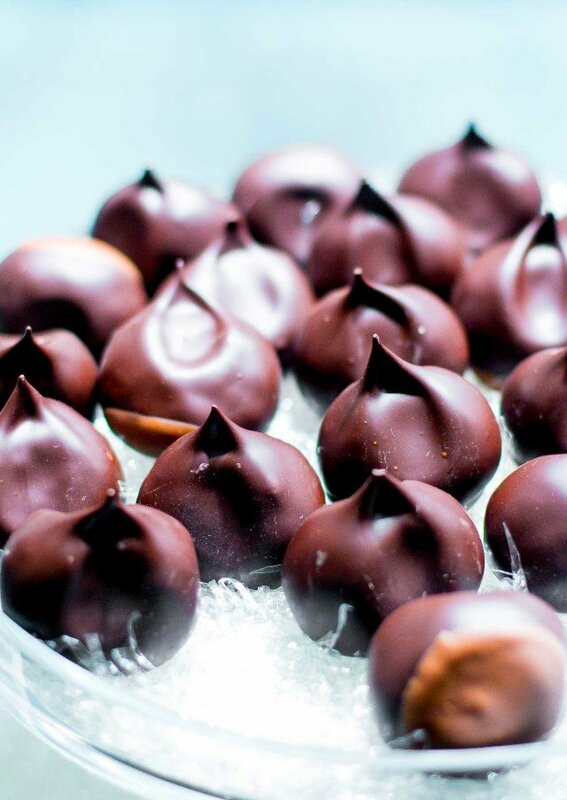 It’s not just a refuge from the busy boulevard, but it’s an homage to all things chocolate. 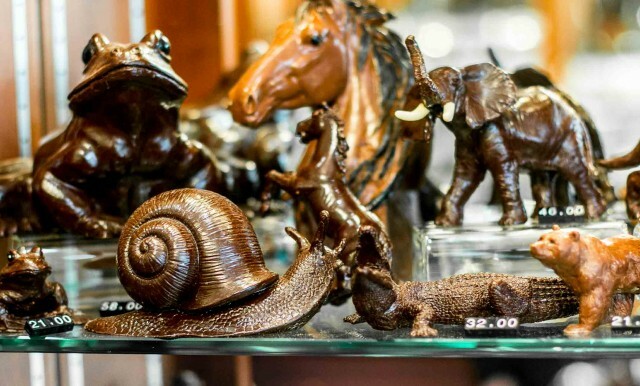 At Jean-Charles Rochoux you’ll find lots of wonders of chocolate to keep you enchanted, including the amazing chocolate sculptures that Monsieur Rochoux creates in his workshop just beneath the tidy boutique. This kind of craftsmanship is rarely found anymore, even in a chocolate-obsessed city like Paris. And it’s hard not to be wowed at the sculptures made of pure chocolate, in whimsical shapes of all sorts and sizes. One particularly amusing one is of a man’s torso with six-pack abs. Of course, in France those are called “tablets of chocolate” and here, Monsieur Rochoux makes them out of actual chocolate. (What I wouldn’t give for the edible, and non-edible kind!) But I’m not complaining because there’s plenty of chocolate here to make me happy. Very, very happy. 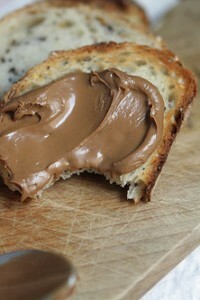 His gianduja-enrobed almonds are made by taking a toasted almond and coating it with crackly caramel. 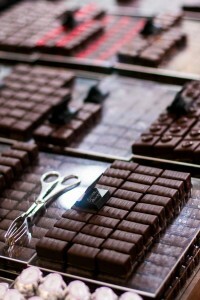 Then they’re hand-dipped individually in thick chocolate and hazelnut paste before a final dip in dark milk chocolate. They come packed up in little sacks, as well as larger boxes, but the little baggies I find are easier for rifling through and snitching a couple out of on the métro ride home. 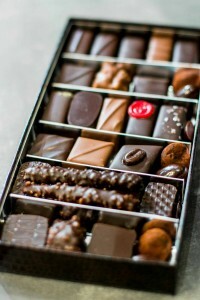 Other treats to look out for are the tiny squares of chocolate truffles, each little cube melts perfectly in your mouth. They only last a couple of days, due to the fresh cream used to create them. So eat them fast! When I recently brought some visitors into his shop, I insisted they try his housemade caramelized paste, which is one of the best things in Paris. Actually, it’s one of the best things in the world. I’m also crazy for his dark chocolate bar with caramelized hazelnuts inside, each bite a revelation of flavors, with the crunchy Italian nuts melding with the bittersweet chocolate, to create the perfect flavor combination. Of course, his regular chocolate are great as well. I often like to get a box to give as a gift – although I’ll sometimes just pick up one for myself. True love doesn’t need great abs, but I can tell you that simple knee lifts are more effective than crunches and sit ups because you can do many more of them without hurting yourself. And you can do them anywhere, which might just alter your experience in Paris by a huge increment. He is very cute, that one. I tried La Maison du Chocolat by myself, Michel Chaudun thanks to you, but so far I haven’t experienced chocolates as extraordinary as those of Pierre HermÃ©. What about you? Oh dear, I can still taste those wonderful truffles from our visit, David! And now I’m feeling extremely guilty because those were my husband’s absolute favourites from the selection I brought home, too, and I didn’t get him any for Christmas. Thank heavens Valentine’s day is just around the corner!! Thanks David, I’m going to have to find cash for an airfare to visit John-Charles Rochoux. There is nothing that I have seen in Melbourne that comes remotely close to those wonderfully cute sculptures. I’m jealous & your lucky living in Paris. Now I have to go find a chocolate fix…. The mere sight of Rochoux’s brown crocodile-embossed box tied with its satin ribbon makes my heart beat a little faster. 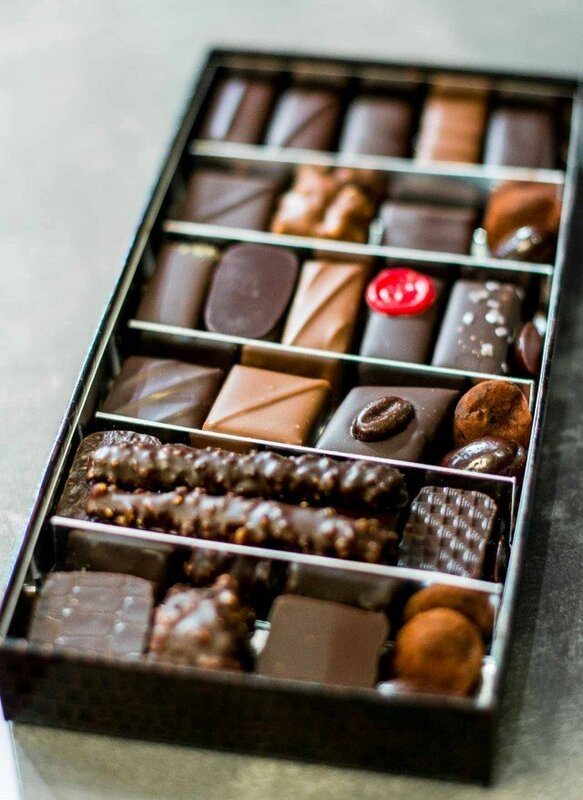 The bonbons are divine and it’s a wonder to watch Madame as she carefully assembles each and every box to order. Ummm, we have one box of orangettes left Rochoux and I gaze at the bespoke ribbon from my last ballotin from there. I have to say,their boxes are the best and I have them all. Good thing I have a ticket and hotels booked for the last week in February. I also was going to blog this week about the fact you spend too much time in Paris patisseries when you are using pierre herme bags to line your wastebaskets. Wonderful blog, David. That sweet little rabbit is adorble! oh, my goodness, looking at those orangettes and hearing your description was a rapturous event … it’s not fair to tease like that!!! but on a serious note, david, i would be interested in hearing your opinion on belgian chocolate as well. i got to sample some from neuhaus only on my last trip. and that recipe for the lemon buttermilk sherbet sounds divine…thanks! oh my goodness, seeing those orangettes and hearing your description was a (gasp) rapturous (sigh) event…it’s not fair to tease like that! but seriously david, i would be curious to hear your opinions on belgian chocolates as well…i was only able to experience the neuhaus variety, which i thought was good … but somehow i remember some years back someone bringing some truffles back which were absolutely org@$mic… so i’m thinking there’s more to explore. btw there is an awesome handmade confectioners shop (in brussels) called LA CURE GOURMANDE in the lower town, which has divine caramels and nougats. thanks so much for the lemon buttermilk sherbet recipe, and good luck with your book! thought that first one got lost lol! Happy 007. I write to thank you for your inspiring newsletter. After reading it I made the Lemon Buttermilk Sherbert AND the Dulce de Leche Brownies….what can I say, my guests were beside themselves and 4 days later my evenings are still ending in lemon chocolaty bliss. I look forward to this sweet year with you! Petra: Who needs Daniel Craig? Well, if you don’t I know a few folks who do! Paul: I wish it was luck that I got to live here…you should see me Visa paperwork, aka le doissier! I have another appointment at the Préfécture later this month since since my last 3 visits, they were unable to finish the paperwork and I need to go back for some unspecified reason. GuyAimeChocolat: I haven’t tried Pierre Hermé’s chocolates in years, since it’s almost impossible to shop in the rue Bonaparte shop with the crowds (I guess I could go to rue Vaugirard…) But I do remember liking them very much & they’re all make right downstairs, which I got to see once. Lucky you David, you have seen all the most wonderful secret places of Paris that smell of chocolate! I tasted Pierre HermÃ©’s chocolates by chance around christmas 2005 when in line rue Bonaparte; Pierre HermÃ© had been kind enough to hire waitresses to give us chocolates while we were in the longest waiting line I had ever seen in front of his tiny shop. He did the same on new year’s eve. I had never thought of buying his chocolates, and in the end I had the best chocolates of my life for free while freezing on the pavement. Now I think he is the most under-estimated chocolatier in Paris. you ARE fortunate. i’ve found one good one here in naples (although david may be able to help me with that one) and my island of ischia has none. I have been enjoying your blog for a while now and it always makes me miss Paris. Congratulations on your nomination for the best food blog and best wishes for a very good 2007. This post is definitely one of my favorites. You are at your absolute best here–both in writing and physical form. Love it. Love you. 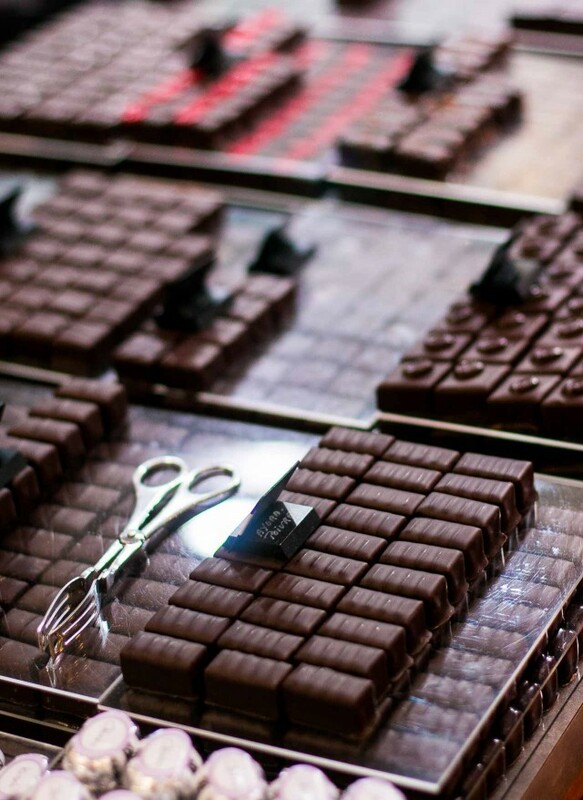 Love all that sculpted chocolate! I found your blog while searching google for “chocolate torsos.” THank you so much for aiding me in my search. Love the blog, love you. Will be back often. Please post more chocolate torso photos too…they are divine.